Executive Director Dawn Saffayeh accepts eleven handmade quilts from Theresa Moran, who is a member of NYC Metro Modern Quilters Guild. Her grandfather grew up in the care of the former St. Vincent’s Services. 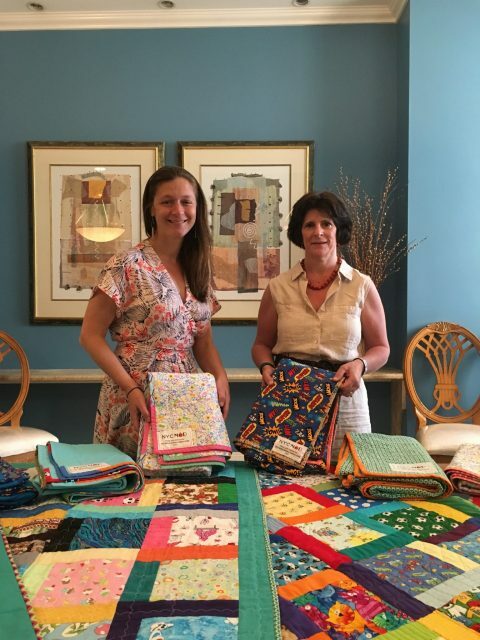 Moran is a member of the NYC Metro Modern Quilters Guild, which creates and donates quilts to worthy organizations throughout New York City. The group’s mission is “to develop and promote the art of modern quilting through cooperation, education and community.” It was established by Victoria Findlay Wolfe in early 2010. Why donate quilts to HeartShare St. Vincent’s? “I’m very glad that we decided to donate the quilts to HSVS. It means a lot that our handmade quilts are for children in foster care,” Theresa said. In her spare time, the Pratt alum volunteers actively at her children’s schools, including teaching a cooking class weekly. Her four children range from first grade to middle school.